Challenge: A 15-year-old patient with multiple years of periodontal concerns being co-managed with a periodontist without resolution. Background: A 15-year-old female has been presenting for care at our practice since age 4. From an early age the patient displayed behavioral concerns and chronic poor home care. 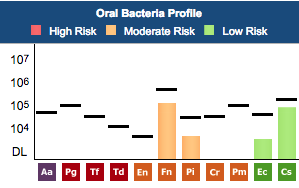 The dental history is early eruption of #19, three month recall due to levels of supra and sub gingival calculus, and mild bone loss resulting in a referral to the periodontist who prescribed Biotene® and alternating care for a few months. Orthodontics were placed in 2015 and upon completion, the full mouth series of radiographs revealed even more bone loss, resulting in another referral to the periodontist who prescribed Biotene® and increased recall. On June 20th 2018, the periodontal assessment revealed gingival hyperplasia along with pliable gingival margins. Medically, the patient’s mother noted nothing significant, however at age 15 she has not begun menstruation. Her appearance was pale and very thin. The mother reports for several years being unable to motivate the patient in areas of oral and personal hygiene. Solution: A MyPerioPath® specimen was collected June 20th 2018, and a debridement was completed. Based on the results, a treatment plan was developed to include 4 quadrants of scaling & root planing, administration of systemic antibiotics to target bacteria identified by the MyPerioPath® and possible low dose doxycycline for 3-6 months, if needed. Post-therapy another MyPerioPath® will be performed. Further medical investigation was recommended such as checking of Vitamin D levels, estrogen & progesterone levels and thyroid. Result: Therapy has been suspended. In consult with the mother about the MyPerioPath® results and the recommended treatment plan, the mother reluctantly revealed the daughter was diagnosed with anorexia nervosa. I informed the mother I would be forwarding the test results to the daughter’s pediatrician and periodontist. She made me aware that the daughter’s Vitamin D level was very low and being tested every other day. In addition the daughter’s thyroid and hormone levels were significantly low too. The mother stated the daughter is now in a 6-week eating disorder program followed by outpatient care. The mother agreed to therapy once the eating disorder is under control. Upon a visit by the mother for another sibling’s care, the mother stated the daughter was improving but still has a long way to go. I am appreciative of the level of care and concrete information I can now provide to my patients by utilizing OralDNA® salivary testing services. In conclusion, the underlying cause for this patient’s gingival hyperplasia and low to moderate bone loss is anorexia nervosa. Early in this patient’s care, I was suspicious there may be some depression concerns. This in addition to the clinical signs was a reason for referral to the specialist and a non-conclusive diagnosis. Now with testing I can rule in or rule out bacteria being a cause for the inflammation so we can explore other possible reasons for the inflammation and provide more timely care. Brenda graduated from Northampton Community College in 1998 with a degree in Applied Science.She holds double licensures for PA and NJ. 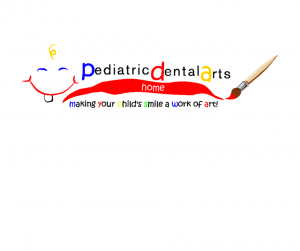 For three years, she practiced in adult dentistry and since 2000, she has practiced strictly in pediatrics. Over the years, she practiced mobile dentistry providing hygiene services to schools and low income communities. Under a grant program at Lehigh Valley Hospital, she was able to assess the need of mobile dentistry within the surrounding counties. In February, she dresses as the Tooth Fairy for Children’s Dental Health month to educate preschool through elementary school students about the importance of dental hygiene. She is quoted “What I enjoy the most is the interactions I have with my patients. I love watching them grow from 2 years through college.I enjoy being able to help them keep their beautiful smiles healthy.” Brenda is a mother of triplet girls age 13. She enjoys decorating, gardening, traveling and being at the beach.